Houston Rockets superstar and MVP candidate James Harden returned to his former middle school in Los Angeles to celebrate his 2017-18 season on Sunday afternoon, June 24. 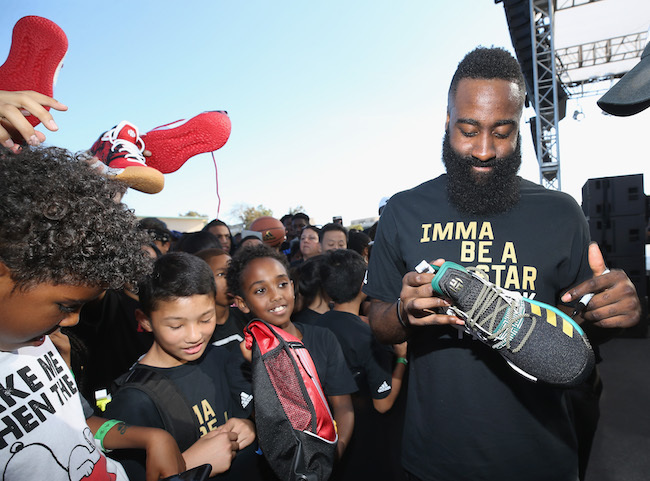 Harden joined young basketball players and students, plus friends and family at the place where it all started, Audubon Middle School, for the adidas Basketball “Imma Be a Star” Block Party. Harden and adidas Basketball General Manager Kris Aman unveiled 12 new outdoor basketball courts for the school and announced that Harden and adidas are also updating the indoor basketball gymnasium in time for the start of school later this year. There were on-court basketball competitions and games led by some of the sport’s top trainers, live musical performances by Rick Ross and Famous Dex, plus food and more for everyone in attendance. Harden’s mother, Monja Willis, was also on hand to discuss his incredible season and his road to the NBA from picking up the game as a kid to what he has accomplished so far in his career. The “Imma Be a Star” event title refers to a note Harden left on a piece of paper for his mother as a freshman in high school listing his dreams. Since then, the point guard has reimagined his position and has left his mark on the sport and on the record books ever since. Follow the conversation at @adidasHoops on Instagram and Twitter with #ImmaBeAStar.